Porcelain has both a purity and fragility, but also a surprising strength. 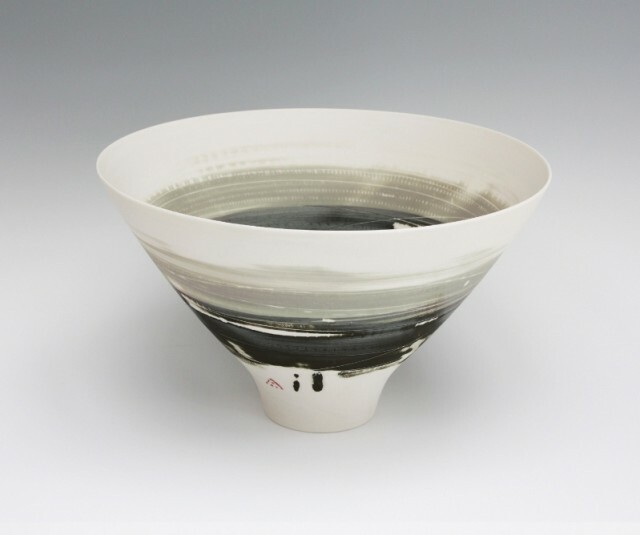 It is often finished with a hard glaze, but I love the tactile quality of the unglazed, sanded surface, which is smooth and silky to the touch, encouraging you to follow the lines and shapes around the forms and feel the indentations made by the markings. Most are glazed on the inside, rather like a shell that is hard and glossy inside but sanded to a smooth finish by the sea on the outside. Simple marks, both natural and man made and usually accidental are what I return to again and again. These are often linear, graphic or randomly textured; leafless trees in winter, markings on pebbles and shells, snail trails, a child’s drawn line, worn out paint.